You will first get a call of one line of text. This is to avoid the spam. You can then type /mdc and go to recent 911 calls and click the call for more information. Adding additional can be used for supervisors to add any notes to the call. Contact caller is self explanatory. Clear call is used only to say the call is over, not to remove yourself. If you use this, you can make units unable to respond to the call. Please use common sense for this. It is very easy to understand. First type in the name of the suspect. (without the underscore) and it will come up with a long list of options. You can then add charges to the suspect which then appear in Outstanding Charges. You can then select the charge you want to manage, press menu and you get given two options. Clear charge sends it to previous charges meaning the suspect is not currently wanted. Remove charge completely deletes the charge from the suspect. You then click personal information where you can see if they actually possess a license legally. 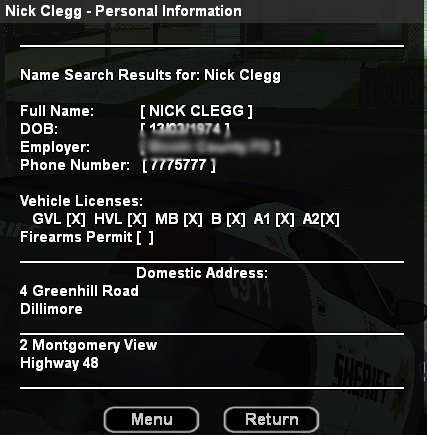 You can then click Menu and manage Weapon Licenses or Vehicle Licenes which are very straight foward. If the license shows up orange, it means the license is currently suspended. If you require any help with this, please feel free to post below. Don't know what you mean by that? *Claps his hands* Bravo! Bravo! Guess he's saying that you need to get used to it.